Lytham St Annes Lifeboat have taken their first steps in planning ‘Leg It For The Lifeboat 2015’. The event is to be held on Sunday 19th April 2015 commencing at 10:30am from Lytham Lifeboat Station, and finishing at St Annes Lifeboat Station. 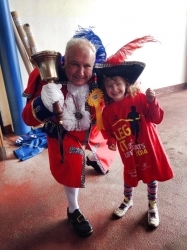 It is a fun event for all the family where participants run, walk or crawl between our lifeboat stations, which is a distance of about 3.5 miles or 5K in new money. The cost to enter is £10 for adults and £5 for children with all monies going to help fund the work of the RNLI Lytham St Annes Lifeboat Station. Fancy Dress is optional and participants are encouraged to raise Sponsorship as this would greatly increase the benefit to the RNLI. Official Sponsorship Forms are available here. You will soon be able to register for this event on-line.